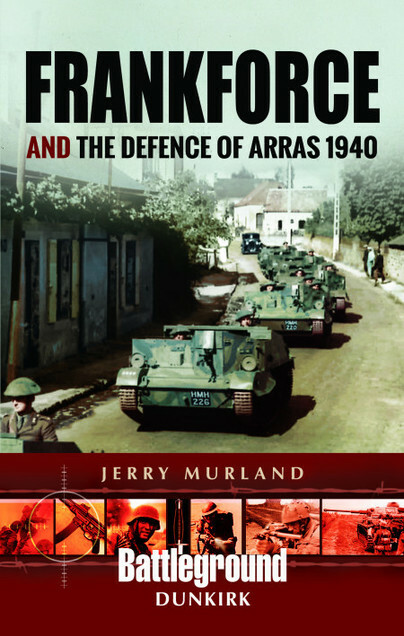 You'll be £12.99 closer to your next £10.00 credit when you purchase Frankforce and the Defence of Arras 1940. What's this? There is no other city in France that has the same associations in time of conflict that the British have with Arras. Since the campaigns of John Churchill, 1st Duke of Marlborough, in the early 18th century, British soldiers have fought in and around Arras, occasionally as an enemy but, more often, as defenders of French and Allied democracy. Battlefield visitors to the area will immediately recognize the names of towns and villages that were as significant to the men of Marlborough’s army as they were to those who fought in the First and Second World Wars. This book serves both as guide to the Second World War battlefields that surround the city and its environs as well as detailing the actions of the British armoured attack of 21 May 1940. The book looks at the strategic situation that led up to the famous Arras counter-stroke and, using material that has not been published before, examines the British and German actions between 20 and 23 May. The only Victoria Cross action that took place during this time is looked at in detail; as is the fighting that took place in Arras and during the breakout. Despite its shortcomings, the counter-stroke achieved the essential element of surprise and caused widespread alarm amongst the German command and hit Rommel’s 7th Panzer Division at precisely the moment when his armoured units were ahead of the infantry and gunners. The British infantry fought well and both the Durham battalions were fortunate that their commanding officers and senior NCOs were men who had already fought in one conflict and possessed the determination to rally their less experienced junior ranks and fight on regardless. Such was the case with the two tank battalions, although sadly they lost both their commanding officers and over half the tanks that went into the engagement. The attack did enable the British to tighten their hold on Arras – albeit temporarily – and, as is often cited, built doubts in the minds of German High Command as to the speed of their advance and contributed to the subsequent Hitler halt order of 24-27 May. The book is supported by three car tours, one of which takes the visitor along the tragic path taken by the Tyneside Scottish on 20 May and two walking routes, which concentrate on Arras. 137 black and white photographs (integrated) and a number of maps derived from regimental histories; and six tour maps provide the battlefield visitor with illustrations of the battlefields as they were in 1940 and as they are today. I have never understood why Arras does not attract more interest among tour operators and guides. Sadly, too many view the city solely as a jump off point for the Somme's July 1916 battlefields. There is so much more to Arras than that in both wars, and this excellent new guide is the ideal introduction to the even less visited 1940 battlefields that surround Arras. This latest battleground guide offers a well-balanced mix of anecdotes; maps and photographs linked with a readable historical narrative make this a welcome addition to the WW2 guiding library. A quaint little book, this publication is part of the series Battleground Dunkirk. They are intended as guides for people wishing to explore the battlefield of the 1940 campaign involving the British Expeditionary Force in France and Flanders. The book commences with an introduction by the series editor. It is followed by eight chapters, the first of which provides the context into why Arras became a centre of fighting during the Second World War. The second chapter the German rout and destruction of the 70th Infantry Brigade is covered. The other chapters focus on the fighting around Arras, and the counter-attack made by two columns from ‘Frankforce’. These events are covered well, including both operational and tactical accounts of the action, and specifically some personal accounts of the fighting. The three car tours and two walking routes included in this will be useful if you intend to visit the area. They provide much detailed information, which should make visiting the area relaxing and logical. Directions are included, and places to stop for a specific event or reason. The book contains several useful, interesting and relevant photographs, which assist in understanding the nature of the area and what a visitor will see some seventy-six years after the event. In conclusion, if you are considering visiting this area to view the battlefields of May 1940, I consider this book to be essential reading. If not, the details of this battle are valuable, although readers may find other accounts more comprehensive. My last observation is whether this format of publication is better on the internet, as changes may affect the tours that cannot be reflected in the book, and the internet is more dynamic. British Military History - Rob Palmer, M.A. If you have an interest in the story of the BEF in France in 1940 this will help with lots of detail and if you want to visit the area, which is also some lovely countryside these days, then this will be an invaluable guide to have in your car with you. Jerry Murland served in the Parachute Regiment. He is the author of Departed Warriors and Aristocrats Go To War (Pen and Sword Military). He lives near Coventry.